Prosecution demands 5.5 years for former high-ranking investigator Nikandrov | Russian Legal Information Agency (RAPSI). MOSCOW, August 10 (RAPSI) – Prosecution has demanded a 5.5-year prison sentence for the former high-ranking investigator of Russia’s Investigative Committee, General Denis Nikandrov, charged with corruption, prosecutor Igor Potapov has told RAPSI. Moreover, prosecutors asked a court to fine the defendant 65 million rubles ($970,000), prohibit him from holding law enforcement and government posts for 3 years and deprive him of the general rank. Sentencing of Nikandrov has been scheduled for August 16. Earlier, detention of Nikandrov was extended until September 19. Trial of Nikandrov is held behind closed doors due to secret information contained in the case documents. The case is reviewed without examination of evidence and witness questioning because the defendant pleaded guilty and made a deal with investigators. Ex-First Deputy Head of the Investigative Committee’s Moscow Directorate, General Nikandrov, former Deputy of ex-chief of the Investigative Committee’s Internal Security Directorate Mikhail Maksimenko, and his deputy Alexander Lamonov have been arrested and detained as part of a case over extortion of 8 million rubles (about $138,000 at the current exchange rate) that involved an alleged gang leader Zakhariy Kalashov. In addition, investigators believe that they extorted 10 million rubles (about $170,000) from a head of a large joint-stock company. The defendants denied their communications with Kalashov. 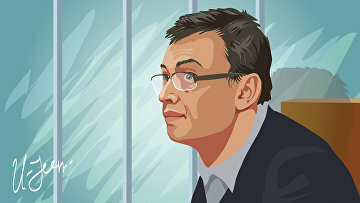 On April 20, Maksimenko was found guilty of taking two bribes and received a 13-year prison sentence. The defendant was also fined 165 million rubles ($2.8 million). According to prosecutors, in 2016, Maksimenko and his accomplice received $500,000 bribe for help with one of criminal cases. He was also charged with taking $50,000 bribe in 2015 for organizing unlawful criminal prosecution of law enforcement officers in the interests of a bribe-giver. On July 26, the court sentenced Lamonov to 5 years in prison for corruption. Additionally, he was also fined 32 million rubles ($508,000) and lost his rank. 15:35 10/08/2018 Prosecution has demanded a 5.5-year prison sentence for the former high-ranking investigator of Russia’s Investigative Committee, General Denis Nikandrov, charged with corruption.